I read this article and found it very interesting, thought it might be something for you. The article is called Happy to introduce the NEW VIRTUAL GEAR! (Release 2.1.1 App MD WiFi) and is located at https://www.magneticdays.com/en/blog-en/virtual-gear-magneticdays/. It has to be said: MagneticDays is more than a smart trainer! After having developed the first Indoor Training System based on scientific approach (which is improved and increasingly accurate with the rapid progress of technology), we are happy to introduce the new release (2.1.1) of MD WiFi App (available for iOS and Android) that allows to satisfy the playful aspect of Indoor Cycling also, improving a unique offer from a technical and qualitative point of view (HTT Methodology) and mixing our high quality workouts with fun. This release offers to all of users/athletes the real possibility to “replicate the effort” (Watt) required in a specific part of any cycle route. 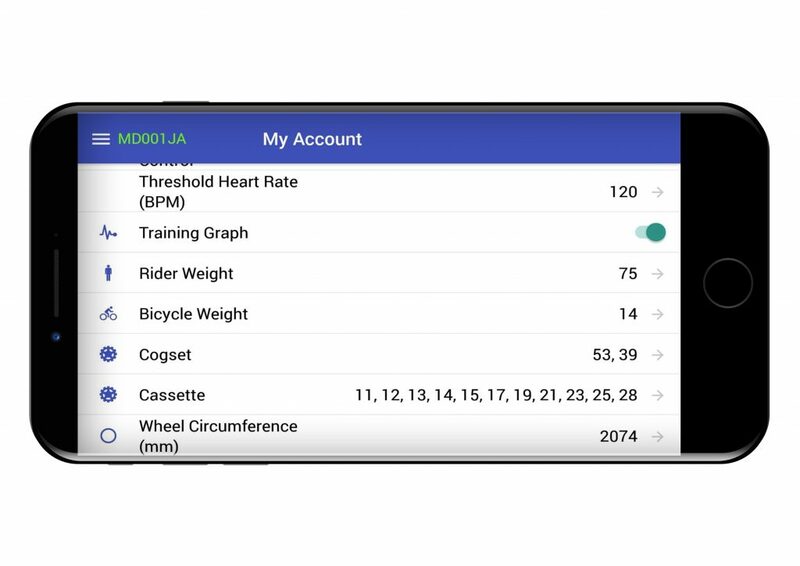 The necessary Data needed for work costantly into the “Phisical formula” (that calculates the effort) are: Rider and Bicycle Weight, Cogset, Cassette and Wheel Circumference. These values must be insert in the section named Settings – My Account of MD WiFi App, before to start the workout. Here’s a focus on 2 important values of the Virtual Gear. Rider and Bicycle Weight ? This value is different from that used for HTT and it’s not important for the purposes of HTT Methodology, but all the users/athletes can be change this value as they like, pedalling in different physical conditions compared to the current one and imagining how the sensations and efforts would be different in terms of Weight. Personalization of Cogset and Cassette ? All the users/athletes will can choose their favorite virtual gear ratio selecting the buttons +/- for chainring (to the left) and cog (to the right), the real innovation of the release. It will also possible to control the virtual gear throught the dual optical remote control. 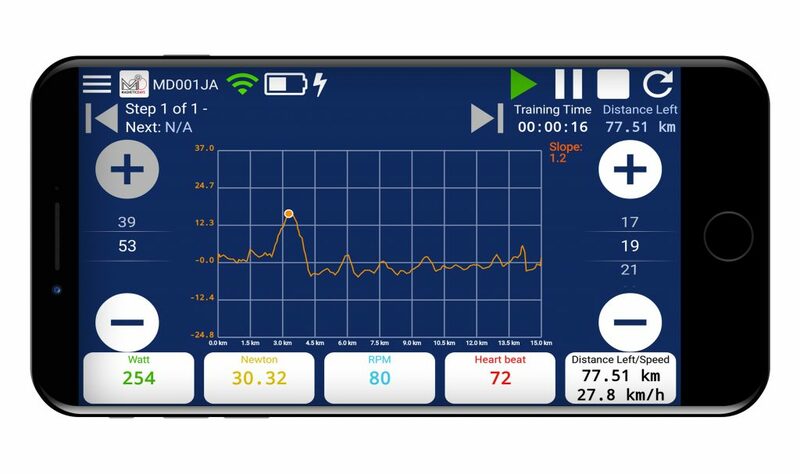 This amazing innovation (the first in the world of Indoor Cycling) allows to the JARVIS System to have at disposal the right Data in order to supply the exact physiological response (in terms of Watt) to the technical gesture conducted by the user/athlete in real time. Furthermore, it is also possible to set the value of Slope (%) of the route/workout (RED for climb and GREEN for downhill). Zwift is a massively multiplayer online cycling and running game and training program that enables users to interact, train and compete in a virtual world. With the new release 2.1.1 of MD WiFi App, MagneticDays becomes the first Indoor Training System able to mix a high quality workout with fun. 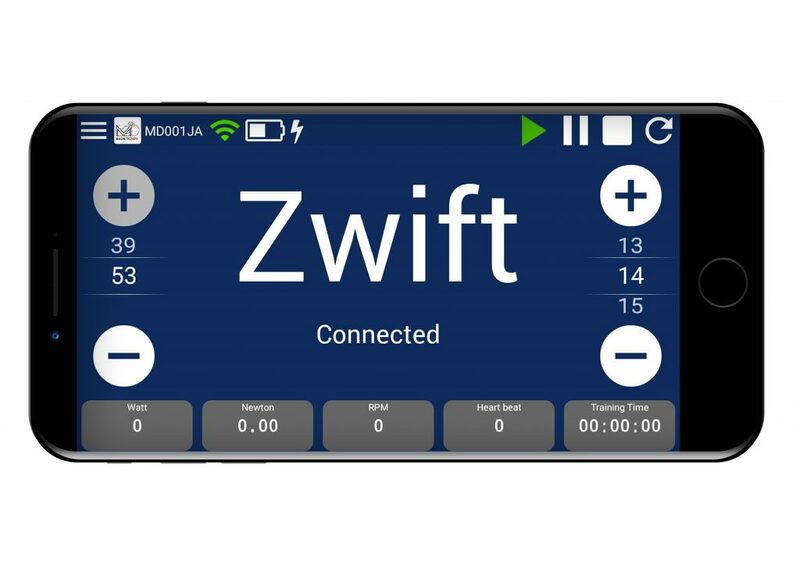 JARVIS System already communicate directly with Zwift, and from today the connection is in a new way if Track Resistance mode is on. The best condition is that to use Zwift with your PC (JARVIS have the ANT+ aerial for PC as standard equipment) and the MD WiFi App installed on your tablet or smartphone. And last but not least, the possibility to “ride” on JARVIS System the most famous cycle route in the world (or your personal cycle route) as .tcx or .gpx file imported on own personal profile of our Website www.magneticdays.com. These cycle routes will be available to the MD users/athletes in the near future and published on our Website (section named Self Managed Workouts and Routes) where are already available a few cycle routes (free download). The Virtual Gear Handbook MD WiFi App 2.1.1 is available as .pdf file here. Joule incremental test by MagneticDays: the new Conconi!